At the end of a New England cruise, our Princess ship was docking in the Brooklyn port, I grabbed my camera and made my way up to the top deck. It was just before sunrise and still dark enough for the lights on the Statue of Liberty to remain on. Yes, I waited until the Statin Island Ferry came into the frame. I'm glad I had my travel Benro tripod and my 70-200 lens. Oh my Wayne, this is incredible. Love that Lady Liberty is lit and you caught the scene so well in the fading light. Wow! This is fantastic! Nice colorful capture, well composed. Wonderful colors and types of light in this image. I'm glad you had your equipment with you too! Lovely tones and colours. 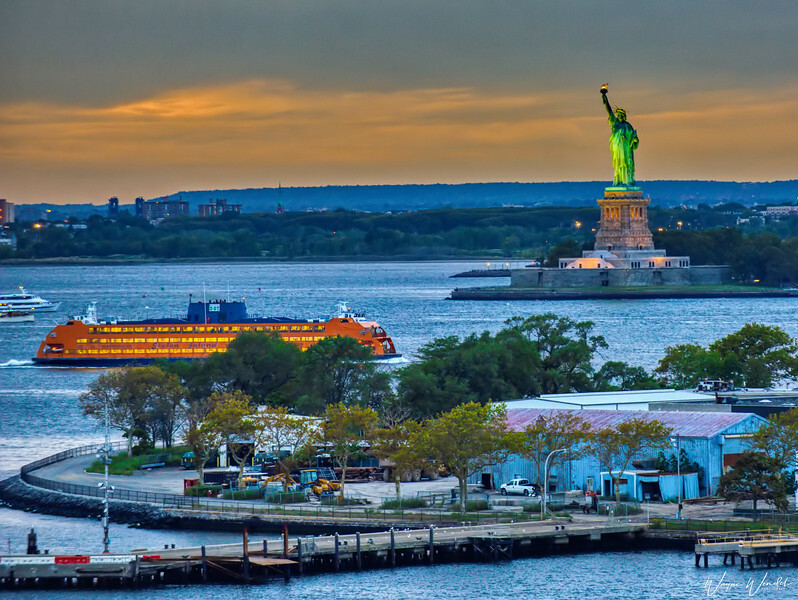 Great capture of the Lady Liberty, love the composition. Lovely photo with superb colours. Nicely composed to show the attractions of New York harbour!